The Terminator franchise can only go up from the dismal mark set by Terminator Genisys, right? With the flicks back under James Cameron's guidance, and the directorial reins handed over to Deadpool director Tim Miller, production is underway on the untitled sequel that ignores everything after Terminator 2. How do we know? Because the first official look is here, featuring the film's three badass leading ladies. 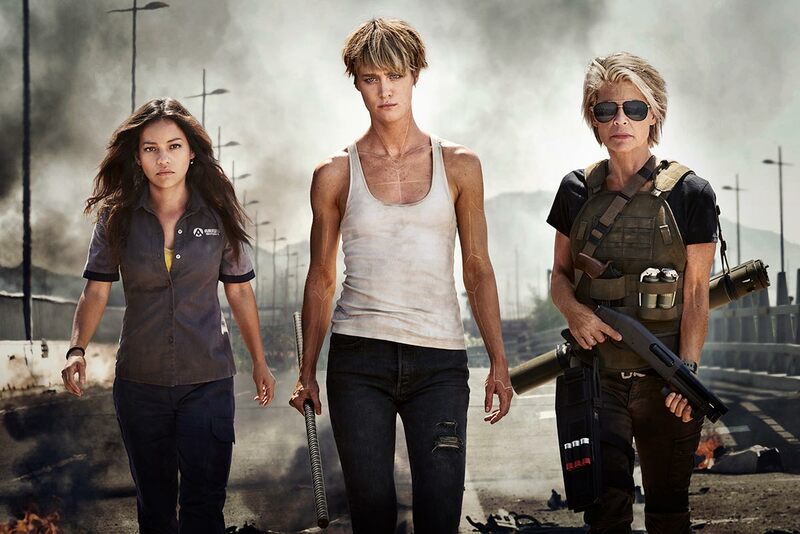 The image reveals Linda Hamilton's return as Sarah Connor, looking like she's ready to blow up all the terminators she can find. Mackenzie Davis is front and center as soldier Grace, joined by newcomer Natalia Reyes as Dani Ramos. Not pictured is a certain T-800 played by Arnold Schwarzenegger. Nor are confirmed co-stars Gabriel Luna and Diego Boneta. If you're wondering how John Connor fits into the scenario, actor Jude Collie will be playing him but it will be Ed Furlong's 1991 likeness using CGI. I find it hard to get too worked up over this image because Terminator Genisys gave us loads of photos of castmembers standing around with guns looking tough, and the movie sucked. So while I'm excited to see Davis in anything and the return of Hamilton is cool, the only thing that matters is if the movie's awesome and we'll find that out on November 6th 2019.